For centuries, terrors have existed just outside our understanding. The public may know or even suspect creatures of the night exist, but millions have managed to go on with their lives, focusing on the mundane, the safe. We’ve passed off the truth as a child’s fairy tale or the ramblings of crazed lunatics. We’ve ignored the reality in order to survive. Falling Scales Chapter Two is written by Flames Rising Project Manager Monica Valentinelli. 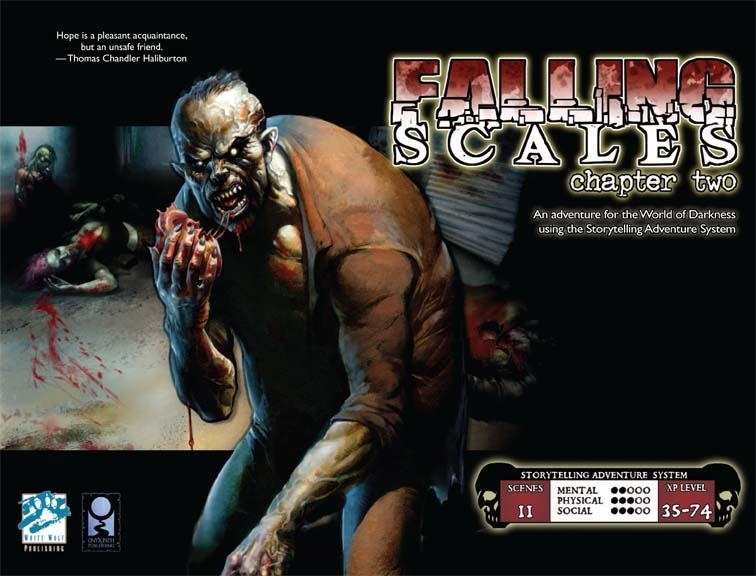 Get Falling Scales Chapter Two in PDF and Print formats at RPGNow.com! Preludes. Some of my best memories of Storyteller games circle around Preludes. I could sequester away a player for perhaps an evening and, for a session, really get into that particular character’s head. Dice rarely hit the table. It was about motivations and character. 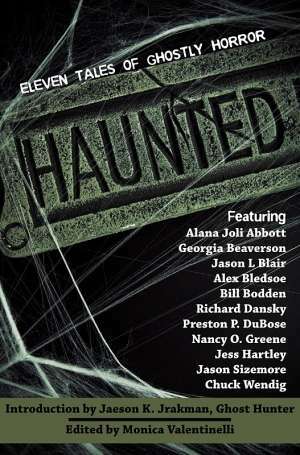 I mention this because this eBook flirts with being a look at preludes. Let me clear that it isn’t, but even the author allows that some Storytellers will use it for exactly that purpose. 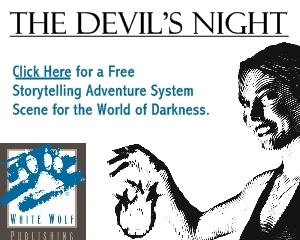 The PDF’s artwork is mostly good. In fact, there are some pieces within the file that are damned good (no pun intended. Really.). I personally liked Shane Coppage’s art the best (the cover belongs to this artist). The artwork proved a little distracting in that some pieces look like Hollywood was tapped for character inspiration. 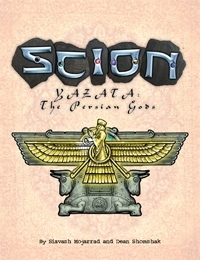 Yazata is a new Pantheon for Scion done in the style of the Companion Pantheon sections for the Tuatha De Dannan, Celestial Bureaucracy, and Devas in the Scion Companion. 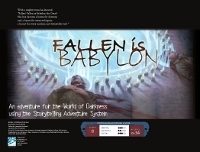 It offers a look at a new Pantheon, their history, virtues, and PSP, some Birthrights, sample characters, and an examination of their Overworld, Underworld, and a Titan to menace them. Yazatas also offers a new All Purpose Purview, Stars, and an Adventure, The God, The Bad and the Ugly. My familiarity with Persian mythology is mediocre. I am more familiar with it than the typical fellow on the street, but I would not say I have a professional’s grasp of it. Take my comments therefore with the appropriate grain of salt. On the other hand, I have run Scion heavily for over three years and have a good idea of how it works. 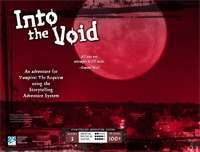 As this is going up on a horror site, I’ll note like the other Scion books Yazata is not a horror game; if you’re looking for something to give a good scare at the table, you will want to give this a pass. 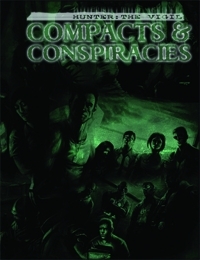 Compacts and Conspiracies is available now at the Flames Rising RPGNow Shop. Paterfamilias contains a collection of scenes, Storyteller character records, a number of hyperlinks to various portions of the text as well as bookmarks, so you can always jump right to what you need with just a click. 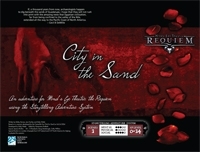 There’s also a new hunter group provided, as well as errata for Requiem for Rome and Fall of the Camarilla. 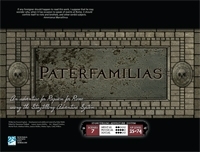 Paterfamilias is available at the Flames Rising RPGNow Shop. I’m still six feet under only I’m under snow and it’s actually closer to six inches. What’s a little bit of exaggeration between friends? After all, you’re the one reading a RPG review, so it stands to reason that you like either telling or hearing stories. For those of you who missed my review of Book of the Dead, which you can read here (don’t worry I’ll wait), I’m in the midst of a look at White Wolf’s view of the Underworld. 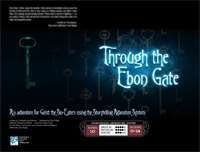 Today, we’re going to visit the Ebon Gate, a SAS adventure intended for Geist: the Sin-Eaters. 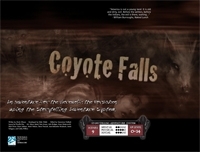 This adventure is 38 pages, although the first and second pages are full color and black and white versions of the cover. The layout follows the Geist format, which means subtle blues for color, more keys than you’ll find on a school custodian’s key ring, and big whopping numbered pages. Being a wage slave at a retailer forces me to think a great deal about Black Friday, the holiest of Capitalism’s holy days. Since I’m trapped into pondering it non-stop, I thought I’d pass along the blessings to you all. I’d like to believe, however, that you’ll actually find these shopping guidelines more useful than a 600 count of pink bed sheets (no offense to those of you needed said pink bed sheets). I going to revisit some games I’ve reviewed over the past year (and some I didn’t) for the sole purpose of finding the best of the best. The holidays are afoot, so some of you will have free time over the next month to game. It’s also Winter, the best season for gaming (inmyhumbleopinion). Being that you’re reading this on a horror-themed site, I’ll try to focus a bit on the Black Evil Darkness that is Black Friday rather than the post-Thanksgiving hooha. In Unknown Armies, something called the Swap Meet exists. It was one of those mystical places where you buy the memory of the date you never had in exchange for the memory of watching your first child being born. 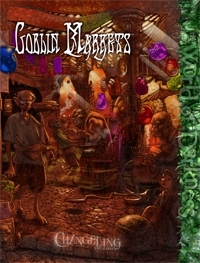 While Goblin Markets doesn’t come across quite as harshly as the former example, the theme of the book is caveat emptor. The reason why I’m bringing up both games is to illustrate how wickedly cool and troublesome such a place can become. These places are hard to get into and so much more difficult to escape. Oh, you may leave the market easily enough. It’s just the choices made while midst the vendors that will haunt you. These places allow for once-in-a-lifetime meetings between characters, a look at what the characters really want, and enough subplots to seed an entire campaign. As the player characters plan for All Hallows Eve, they suddenly find themselves embroiled into a deadly fight with a pyrokinetic named Gabriella who has lost control of her ability. Several buildings around the city are on fire; this offers the player characters plenty of options to find and determine the best way of dealing with an “innocent” teenage pyrokinetic.